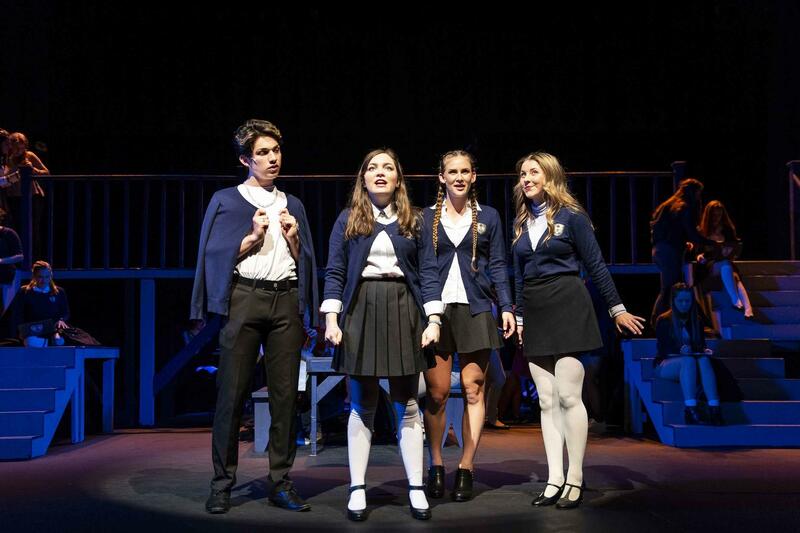 Students perform in Granite Bay High School's original production of Ranked. A new musical explores life in high school in a way that's eerily familiar. It's called Ranked, and it's set in a dystopian world where your class rank — determined by grades and test scores — governs everything from where you sit to what your future holds. There's a mean girl, ranked No. 1; a student who refreshingly doesn't care about rank; and a student on the edge who's under immense pressure to improve their standing. Really, all the characters are under immense pressure. It's a major theme throughout. And at the end of Act 1, there's a major plot twist: It turns out, one of the main character's parents is paying to inflate a child's grade — and the student had no idea. "We're literally watching our story that we wrote play out in the national news," says Kyle Holmes, a theater teacher at Granite Bay High School in Granite Bay, Calif. He and David Taylor Gomes, who helps run the school's musical, started writing the story last spring, long before the Justice Department announced charges against about 50 people in what prosecutors called the largest college admissions scandal in the U.S.
That scandal — and the gall of wealth and privilege in America — has been the subject of conversations in nail salons, at dinner tables and even in the halls of Congress. Just this week, more than a dozen parents agreed to plea agreements and others were indicted. And Granite Bay High School has another connection to the scandal: The guy behind the now-infamous scheme, Rick Singer, started his admissions counseling business outside Sacramento, not far from Granite Bay. In the past, he actually worked with students at Granite Bay High School. Last spring, exasperated from the uninspiring list of show choices, Holmes and Gomes set out to write a show that was relevant and had realistic characters for high schoolers. They wanted to write something that explored life at a school like Granite Bay. Holmes, who wrote the book for the musical, says it's easy to see the pressure to do well at Granite Bay. "[Our students] are stressed all the time. They're staying up late, they're not sleeping, they're studying." "Did I tell the future? I don't know," Gomes says with a laugh. He wrote the play's music and lyrics. "There was definitely a tangible energy in the air when we realized our story was accurate." So how did this story, written months ago, come to be so spot-on? Early in the process, Gomes and Holmes involved experts: their students. They asked students to submit monologues, and they held workshops where dozens of students shared what their lives were like. They wanted to dig below the surface — beyond the idea of "school is hard, tests are hard," Gomes explains. He says they wanted the good stuff — "Not what they tell their parents, not what they tell their friends, but the things that they think about and don't express." Over and over again, these conversations came back to the stress of academics and the value of self-worth. Many of the things students said made it directly into the script. In the show, Emma Harlow, a senior who plays student Sydney Summers, delivers the line, "How do we know the difference between who we actually are and what people want from us?" She says that line gives her all the feels. "It really hits deep." That's partly because Harlow, the real-life student, actually said those words to Holmes, her theater teacher, months ago. "I felt that my whole entire life," she says. "I'm just doing things to make sure my family looks good and part of me got lost along the way." Some of those feelings are captured in the song "Come Up for Air," when the students in the show begin to reconcile expectations with who they really are. "These waves keep crashing down," they sing. "But we're still there." "Nothing makes you feel more heard than when someone puts your words into another story," Harlow says. "And you know that story is making other people feel heard." Senior Natalie Collins loves a line that comes right after the characters discover a student's family paid for his rank. The line is (spoiler alert! ): "Ryan was playing the game, just like the rest of you." "It's just so disgustingly real!" Collins says. "We're all fighting and we're all playing this game to get to the top, and get to the next step of education, and a lot of hard work — real work — gets lost along the way." Usually, Granite Bay announces its spring musical by posting headshots of the performers in the hallway. But this year, it tried something a little different: Holmes asked students to anonymously submit personal text messages, exchanges and emails that depicted the pressure the students were under from parents and counselors. A: How was the test? B: I got an 86%! A: Oh no what happened? 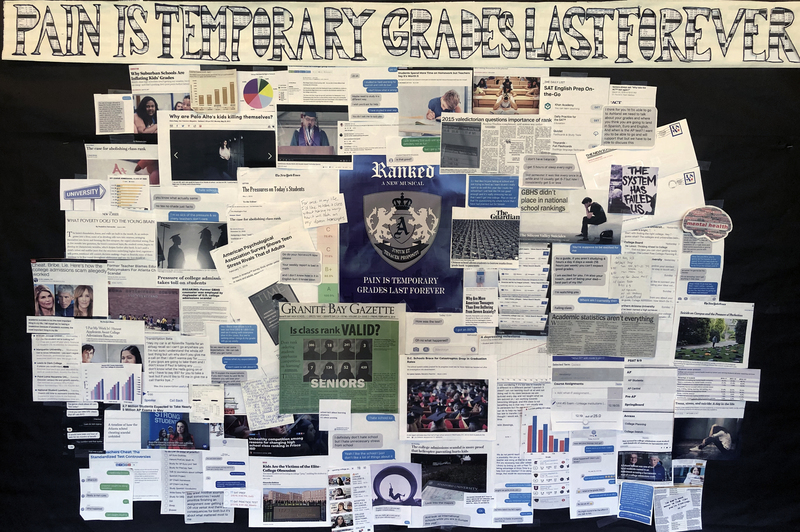 They used the messages in a collage that included headlines from recent news stories ("The Silicon Valley Suicides," "Is class rank valid?") and hung it in the hallway instead of the headshots. A banner at the top reads: "Pain is temporary. Grades last forever." A wall at Granite Bay High School is covered in news articles and messages. It's meant to illustrate the pressure students are under to get good grades and get into top colleges. "Alone, all the messages seemed crazy," Harlow says. "And then we put it all together, and literally everyone feels this way. Everyone's parents are saying these things. We're all getting these emails. It's not good that we're all doing that, but it showed us that there is actually an issue." When the show debuted on April 4, Harlow says she and her castmates watched their parents, and their friends' parents, start to understand just how competitive and stressful their lives feel. Harlow is hopeful those conversations will continue after the show closes this weekend. We had a pretty strange case of life imitating art here in California recently. A high school teacher named Kyle Holmes wrote a musical with a colleague - a show that explored life in high school, one often driven by grades, tests and this immense pressure to get into top colleges. Well, now it feels a bit too real. NPR's Elissa Nadworny has the story. ELISSA NADWORNY, BYLINE: The show is called "Ranked." It's a dystopian fiction where your grades and test scores, they determine everything in your life - from where you sit to what your future is. One of the main characters is a student who has a low rank - she's failing - and she's under immense pressure. NADWORNY: Here's the cast from Granite Bay High School, just outside Sacramento, performing one of the early songs, "Drowning." NADWORNY: At the end of Act 1, a major plot twist - turns out a parent was paying to inflate their kid's grades, and the kid had no idea. Sound familiar? KYLE HOLMES: We're literally watching our story play out in the national news. NADWORNY: That's theater teacher Kyle Holmes talking about the recent college admission scandal where parents paid to get their kids into top colleges. Just this week, more than a dozen parents agreed to plea agreements and others were indicted on charges of mail fraud. And the guy behind that scheme, Rick Singer, years ago, he actually worked with students at Granite Bay High School. NADWORNY: The pressure to do well inspired the lyrics of the song "Someone Always Bleeds," sung by student Anvita Gattani. UNIDENTIFIED STUDENTS: (Singing) But, hey, rich kids like you never have to pay their dues. Who needs to read textbooks when you've got daddy's checkbooks? Someone always bleeds. NADWORNY: David Taylor Gomes wrote the music and lyrics. DAVID TAYLOR GOMES: Did I tell the future? I don't know, but... (laughing). NADWORNY: So how did this spot-on story come to be? Gomes and Holmes listened to their students. EMMA HARLOW: I'm Emma, and I play Sydney Summers. NADWORNY: Emma Harlow is a senior, and there's one line her character says that gives her all the feels. EMMA: So she says this line, how do we know the difference between who we actually are and what people want for us? It hits deep, you know? (Laughing). NADWORNY: It hits deep because she, Emma, actually said those words to her drama teacher months ago. EMMA: I felt that my whole entire life, I'm just doing things to make sure that my family looks good. And parts of me got lost along the way. NADWORNY: Those feelings are captured in the song "Come Up For Air." UNIDENTIFIED STUDENTS: (As Sydney Summers, singing) I'm not about to throw it all away because life isn't fair. I'm going to come up for air. NADWORNY: Emma says the musical is a window for adults to see just how stressful high school life is. EMMA: The biggest use of this show is an entry point to the conversation about, what is our worth? And, like, what's the difference between learning and getting a grade? NADWORNY: Emma and the rest of the ensemble at Granite Bay High School take the stage for the final time this weekend. Elissa Nadworny, NPR News. Transcript provided by NPR, Copyright NPR.